Acupuncture is an effective form of health care that has evolved into a complete and holistic medical system. Practitioners of acupuncture and Chinese medicine have used this noninvasive medical system to diagnose and help millions of people get well and stay healthy. An acupuncturist will place fine, sterile needles at specific acupoints on the body. This activates the body’s Qi and promotes natural healing by enhancing recuperative power, immunity and physical and emotional health. It also can improve overall function and wellbeing. It is a safe, painless and effective way to treat a wide variety of medical problems. At the core of this ancient medicine is the philosophy that Qi (pronounced “chee”), or Life Energy, flows throughout the body. Qi helps to animate the body and protect it from illness, pain and disease. A person’s health is influenced by the quality, quantity, and balance of Qi. Qi circulates through specific pathways called meridians. There are 14 main meridian pathways throughout the body. Each is connected to specific organs and glands. Meridian pathways are like rivers. Where a river flows, it transports life-giving water that nourishes the land, plants and people. In the same way, meridian pathways transport life giving Qi to nourish and energize every cell, organ, gland, tissue, and muscle. When Qi flows freely throughout the body, one enjoys good physical, mental and emotional well-being. An obstruction of Qi anywhere in the body is like a dam, backing up the flow in one area and restricting it in others. This blockage can hinder the distribution of the nourishment that the body requires to function optimally. During the initial exam a full health history will be taken. Questions will be asked regarding symptoms, health and lifestyle. Your acupuncturist also may check pulses and your tongue and may conduct a physical exam. This information is then organized to create a complete, accurate and comprehensive diagnosis of where Qi has become blocked or imbalanced. After the interview process, you may receive an acupuncture treatment. Visits with your acupuncturist may last from 30 to 90 minutes. Where the acupuncture needle has been inserted, you may experience vague numbness, heaviness, tingling or dull ache. Sometimes people experience a sensation of energy spreading and moving around the needle. This is called the “Qi sensation.” All these reactions are good and a sign that treatment is working. After treatment, you may feel energized or may experience a deep sense of relaxation and wellbeing. The number of treatments will vary from person to person. Some people experience immediate relief; others may take two weeks to start experiencing results and months to achieve desired results. Chronic conditions usually take longer to resolve than acute ones. Plan on a minimum of a month to see significant changes. Treatment frequently depends on a variety of factors: your constitution, the severity and duration of the problem and the quality and quantity of your Qi. An acupuncturist may suggest one or two treatments per week, monthly visits for health maintenance or seasonal “tune ups”. Trigger Point Dry Needling is also an effective therapy to treat muscular tension and spasm which commonly accompanies conditions such as arthritis, nerve irritation, muscular strain, ligament strains and herniated discs. It is called “Dry” Needling because there is no solution injected as with a hypodermic needle during a flu shot. With Dry Needling, the needle itself and the effects it produces within the tissue is the treatment. Dry Needling uses a small, solid filament needle (acupuncture needle) which is inserted in a contracted painful knotted muscle to create a local twitch reflex which is both diagnostic and therapeutic as it is the first step in breaking the pain cycle as research shows will decrease muscle contraction, reduce chemical irritation, improve flexibility and decrease pain. When a needle is inserted into muscle it will also produce a controlled lesion and will cut between three to fifteen thousand individual muscle fibers. The body considers the needle as a foreign invader and will activate the immune system as a response. The cut muscle fibers also produce an inflammatory reaction that your body will respond to not just locally but all over the body to reduce inflammation systemically. Yes. 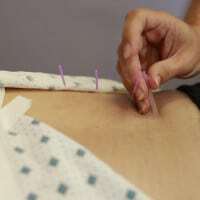 Licensed acupuncturists are required to be certified in Clean Needle Techniques and only use sterilized, individually packaged, disposable needles. However, it is a good practice to verify your acupuncturist’s clean needle technique prior to attending sessions. What brand of needles do you use? Dr. Hoch uses only the finest Seirin brand needles. They cost about twice as much as some other brands but they are well worth it. Can i get a disease like hepatitis from acupuncture? No. Every licensed, board certified acupuncturist is trained to prevent the transmission of diseases. Like in a hospital, acupuncturists use only disposable needles, which are used only once on patients and then discarded. While there may have been reported statistics of possible transmission of diseases over 20 years ago, current standards have virtually eliminated any risk of infection through acupuncture. Acupuncture is an effective form of health care that has evolved into a complete and holistic medical system. It can improve overall function and well being; and is a safe, painless, and effective way to treat a wide variety of medical problems. Acupuncture is performed by inserting needles into specific acu-points on your body to activate your body’s Qi and promote natural healing by enhancing recuperative power, immunity and physical and emotional health. Most treatments take between 20-30 minutes and costs $75. Considering treatment? Work with a Fort Myers Acupuncture Expert. Call Today!